'Going In Style' Is A Disappointingly Feeble Caper Comedy This remake of a wry 1979 comedy about three retirees risking it all for a big score ditches the original's sense of urgency to focus instead on subplots and sentiment. I'm Going To Call Your Parents: Willie (Morgan Freeman), Joe (Michael Caine) and Albert (Alan Arkin) get caught red-handed in Going in Style. Among its many virtues, the bittersweet 1979 caper comedy Going in Style has a distinct tone, located at the obscure intersection of irreverence and melancholy. As three retirees from Queens who rob a bank in Groucho Marx masks, George Burns, Art Carney, and Lee Strasberg are both figures of fun and men who can't bear the thought of drearily cashing Social Security checks and feeding the pigeons until the sun finally sinks under the horizon. The "going" part of Going in Style is crucial: These men are going to die soon and they want it to happen on their absurd, inspired, and oddly touching terms. The new remake, directed by Zach Braff and written by Theodore Melfi, who just scored a hit as co-writer/director of Hidden Figures, misses the spirit of the original film almost entirely. Despite one character in dire need of a kidney transplant, the "going" part isn't nearly as urgent or relevant, which may lighten the death-haunted tone, but also flattens it into a much safer and more familiar tale of geriatric gumption. It's like one of those commercials where the elderly guzzle a beer or a soda and turn young and vivacious again. The jokes are easy, the sentiment likewise. In broad strokes, the plot has less in common with the original Going in Style than with last year's superb thriller Hell or High Water, which follows two brothers on a robbery spree against the bank that's threatening to foreclose on the family ranch. The opening scene finds Joe (Michael Caine) in a similar predicament, teetering on the precipice of defaulting on his home, due to a shady refinancing loan that buried a balloon payment. This same nefarious bank is also involved in a restructuring deal that's stripped Joe and his buddies, Willie (Morgan Freeman) and Albert (Alan Arkin), of the pensions they earned from decades working at a steel mill. When Joe witnesses a million-dollar heist first hand, he gets the idea to take back the money that's rightfully theirs. It would be enough for Joe, Willie, and Albert to be motivated by revenge, pride, and the pieces of pie they've denied themselves at their favorite diner, but Melfi's script saddles the heist with emotional baggage. Joe wants to keep his house for his daughter and granddaughter to inherit. Willie wants money to visit his family more often before his kidney gives out. Albert has a new girlfriend (Ann-Margaret) who's revitalized dormant passions. The subplots pile up, the motives grow diffuse and weak, and it leaves less time for the friendship and camaraderie between these men to deepen as the stakes start to rise. Though all three leads are screen legends, only Arkin is particularly adept at comedy and none of them come across as retirees like Burns, Carney, and Strasberg did in the original. But even Arkin struggles to bluff his way through set pieces like a trial run at a local grocery store, where the men try to shuffle through security with eggs, flour, and deli meat stuffed in their clothes. The challenge for Braff is to make a joke of the slow-moving thieves without the scene itself lagging in kind, but it's agonizingly paced and unfunny, culminating in motorized scooter chase that won't likely be included in Caine or Freeman's career highlight reels. 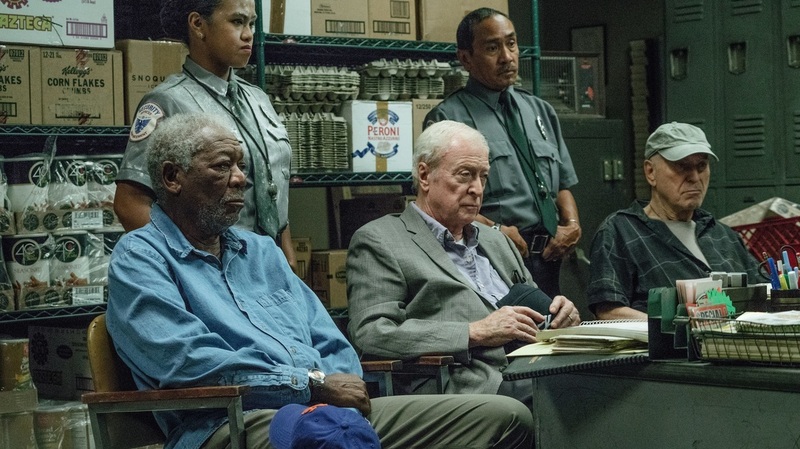 Oddly enough, Going in Style succeeds most as a straight-up heist film. By scaling up the stick-up in the original film to blockbuster size, Melfi has forced himself to plot out the robbery like an Ocean's Eleven movie, with all sorts of clever strategies to make up for the robbers' physical limitations. There's nothing here approximating the charm of George Burns as Groucho Marx, but it's the one and only area where the remake seeks to enhance and build on its source. Mostly it strips away the qualities that made the original such a gem, starting with the bruised soul that compels these retirees to gamble away their remaining years. The new Going in Style hedges it bets.